Imagine this: You are given a chance to have that thing you have always wanted, but it will cost you. You hem and haw, kick your feet, and finally ask, "How much?" An otherworldly voice says, "Less than $1." Suddenly, you perk up. You stand up straight and yell, "I'm in! Here's my dollar!" Could it be this easy? Perhaps. Could it be this cheap? Yes. But, you don't pay in cash. You pay in days. Your mission: Dedicate 100 days to something good for yourself or another. Here's how: The most valuable commodity you possess is time, so the request to give 100 days to a self-proclaimed purpose might, on the surface, seem like a lot to pay. 100 days? That's, like, all summer! You are right; it is one season of the year, but in the big stash of time the average human has on this earth, it's a slim price to pay. We humans average 80 years walking this planet, or roughly 29,000 days. With all those days to fill, giving 100 days to focus on something of your choosing, something pleasurable, or some improvement - well, what's 100 days out of 29,000? It's way less than 1% of your average time on earth. Proclaim your mission: Have you wanted to quit a caffeine addiction? Wish you would read more? Want to be more creative? Or train for mini-marathon? Perhaps photography is your passion, so taking photographs of your life for 100 days would enhance your craft. Take a moment to think about that something that has been gnawing at you to do, and do it. Better yet, let's do it together -- all of us. In America, we are fast approaching Memorial Day (May 25) which serves as a great jumping off point for our 100 day mission. As luck, and the calendar, would have it, American's celebrate Labor Day on September 7. The two holidays fall about 100 days apart on the calendar (105 days this year) and will serve as our official start and finish lines. Other parts of the world are invited to jump in, regardless how we title our holidays, and be part of the project from late May to early September. For 100 days, vow to read a few pages everyday in that book that you bought last year and have yet to open. For 100 days, practice the yoga routine you love, just because you know it's good for you. For 100 days, dedicate one hour each day to using no technology. For 100 days, write one sentence of gratitude each night. For 100 days, stop some little habit you have. For 100 days, wish on the first star in the night sky. Last year was the first time I tried this particular project, spanning from Memorial Day to Labor Day. In the big picture, 100 days did not seem like much, but about 30 days into it, minor struggles appeared. 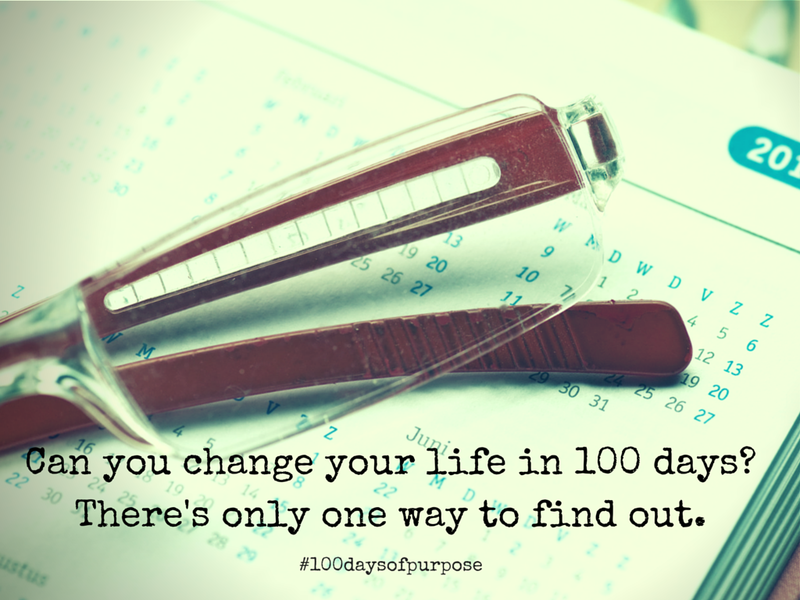 Doing this as part of a group makes those rough patches so much easier to muster, which is why I'll be using the hashtag #100daysofpurpose on both Twitter and Instagram. When we all meet there, with our hashtags raised, we can encourage one another to see our proclaimed purpose through to the end. Proclaim your 100 Days of Purpose in the comments or using #100daysofpurpose on Twitter or Instagram. Then check back over the next 100 days to see what other are doing, tell of your journey, and (best of all) offer words of applause or encouragement to another. I love this idea! I'm going to practice 100 days of gratitude by drawing things I'm grateful for in my sketchbook. I may begin each entry with "Happiness Is..." like I saw another artist do on Instagram. Thanks for sharing!